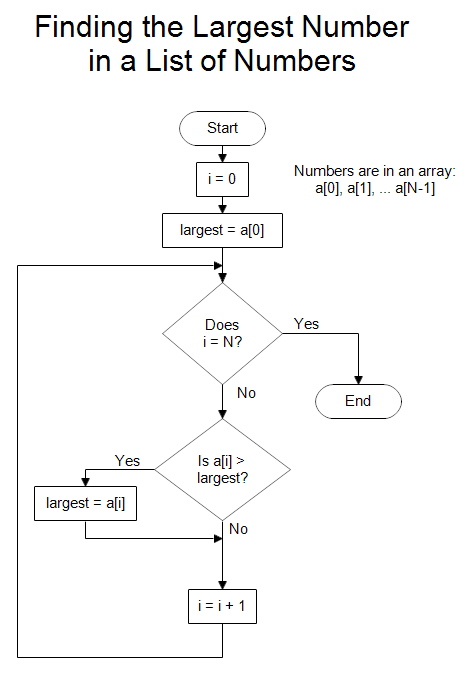 Description This flowchart shows the computer algorithm for finding the largest number in a list of numbers. Basically it gets the first number in the list and assumes it is the largest. It is put into the "largest" variable. Then it looks at each number in the list. If the number it is looking at is larger, it becomes the largest. There are N numbers so i goes from 0 to N-1. In the end, the variable "largest" holds the largest number. Computer algorithms are written without referencing a specific language. They should be clear enough so that their implementation in any language is not difficult. Once RFFlow is installed, you can open the above chart in RFFlow by clicking on find-largest-number.flo. From there you can zoom in, edit, and print this sample chart. It is often easier to modify an existing chart than to draw it from scratch.